The Santa Cruz Metropolitan Transit Department (SCMTD) announced its “Metro Forward Transit Plan,” that, if enacted this September, will result in the largest transit service cuts in the county to date. SCMTD planning and development manager Barrow Emerson, who is leading the initiative, said the metro plans to cut 25 percent of its yearly hours, including 10 percent of UC Santa Cruz hours. This will balance the budget for the 2017 fiscal year by addressing the $6.5 million deficit, previously supplemented by one-time reserves that are now depleted. The route cuts and consolidations have yet to be finalized. The decision will be made on June 24 during the Metro’s board of directors meeting, which is open to the public. The cuts in this proposal were met with backlash from UCSC students, who are already concerned with overcrowded buses in the face of increased enrollment and potential cuts to UCSC Transportation and Parking Services (TAPS) loop buses. TAPS director Larry Pageler will introduce his own “UCSC service reduction plan” later this month to confront the $2.5 million deficit the department carries. Banuelos, who previously worked for the coffee stand within the station, feels a personal connection to the SCMTD drivers that is pushing her to find an alternative solution to cutting routes and the proposed 40 layoffs according to the Metro Union. 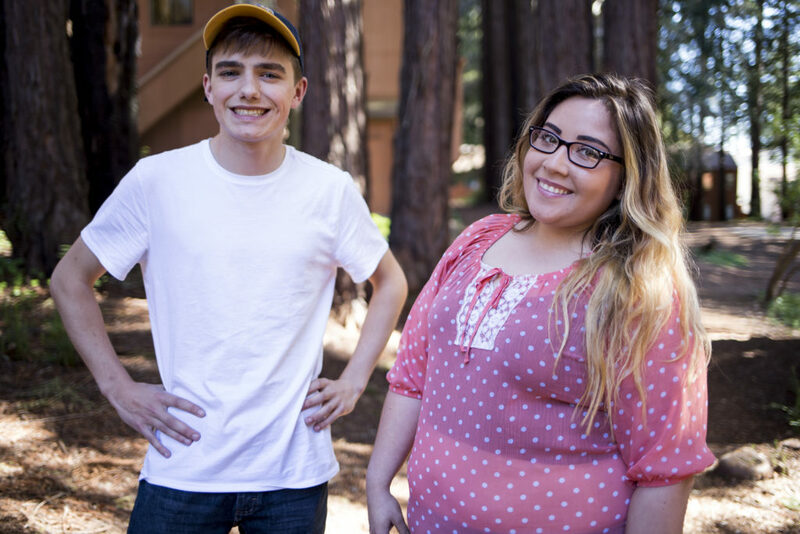 The driver she babysits for persuaded her to inform students through the UCSC Official Students Facebook page. It was through these posts that Miles Mancinelli, a fellow UCSC student, connected with her. He suggested that instead of just informing students, the two take action to propose solutions, and they formed an advocacy group Students for the Santa Cruz Metro that is working in partnership with members of the metro union. 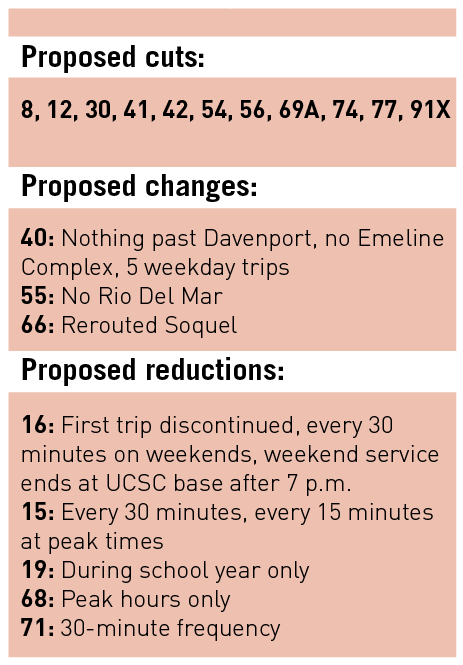 There are 35 routes in the system that potentially face some type of change, including four of the seven bus routes that service UCSC. Pageler said in an email that 50 percent of all Metro ridership within the county takes place on the seven routes serving UCSC: 10, 12, 15, 16, 19, 20 and 20D. The 10, 12, 16 and 19 will all be affected. The intended cuts are a product of an extensive survey of county ridership measured earlier this year, to find out which routes were being underutilized. Federal Transit Administration guidelines also require that public transit service reductions be applied equally throughout a service area to prevent disproportionately hurting low-income areas. Emerson stressed that at this time, the board has endorsed a policy position not to change ParaCruz transit, the door-to-door service for people with mobility impairments. This stance is due to a sales tax initiative that will be on the ballot in November that increases funding to ParaCruz services. If this fails to pass, then changes will be revisited. But changes to the fixed route system will still impact the 150,000 riders with limited mobility who depend on it. There are also no proposed changes to any Monterey county connections. Highway 17, the commuter bus between Santa Cruz and San Jose, which recently had a $2 fare increase, is still being discussed. According to a January service evaluation, 50 percent of the Metro’s ridership were UCSC students. 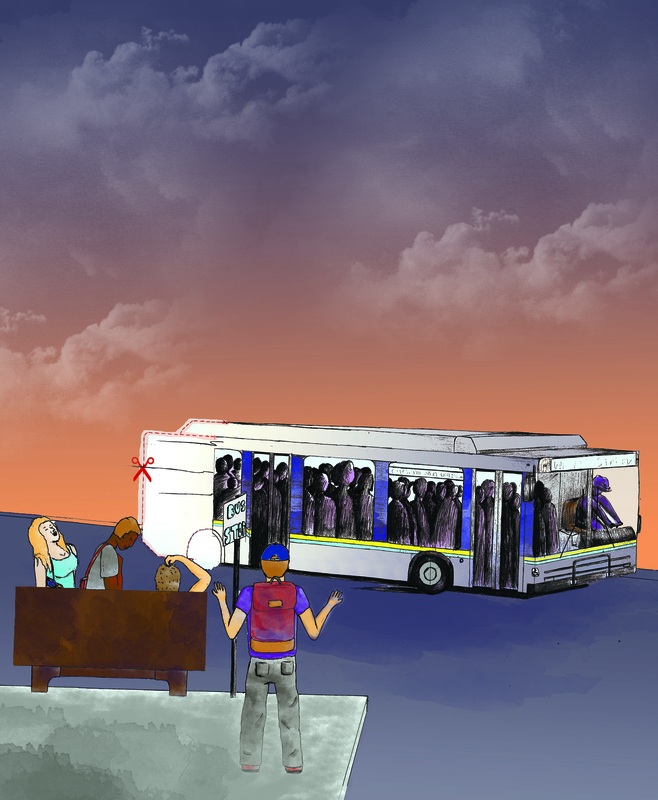 Students are required to pay a $111.66 Student Transit Fee and the university pays a monthly amount to SCMTD based on the number of students who rode the bus that month. The Students for Santa Cruz Metro is still in its early planning stages. The group had its first meeting on March 28 where four students and four bus drivers met to discuss ideas. “What we wanted to do [and] what me and Miles had already talked about, the drivers had already had that same kind of thinking,” said Banuelos, a UCSC student and organizer for Students for the Santa Cruz Metro. She said the meeting was successful in working towards realistic alternatives, as opposed to just protesting the board meeting after the decision was already made, and encouraged other concerned students to take part in the action. For comments, questions and updates on the transit cuts, visit scmetroforward.com.